Jules started to clear-out the rear bedroom on the thirteenth of May. Shane had been gone for exactly three months and it seemed probable that he wasn’t ever coming back. Three months was long enough to hold on to his rubbish. It was two months too long, in truth. The first thing to do was to take down the dusty net curtains. Rented house bedroom windows always seemed to have them while bought-houses never-ever did. The plastic coated curtain wire broke when she tugged hard on it. No more net curtains for a while then. From across the rear garden fence, and across the identical tatty garden on the other side, in the identical rear bedroom window, something moved. Jules smiled to herself. 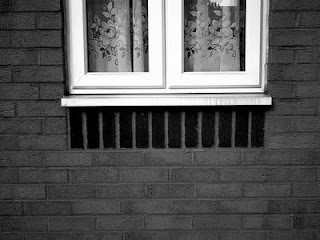 She was being watched from the matching terraced house down the back. A secret admirer perhaps. For a moment, the thought actually fled through her mind that she might undress a bit… but only for a moment. That wasn’t her style, not on first dates anyway. She sneaked another look. It was too gloomy over there to see who it was who was hanging back and looking out but it was clear enough that someone was there. She shook off an involuntary shiver and turned her attention to the black-plastic-bagging of her former love life. After a short while, it actually started to feel good. The window person was back there the next day. Jules was more than half way through bagging up the stuff and wasn’t interested in playing games. Still, out of the corner of her eye, she was never less than half-aware of the spectral figure two gardens away in a matching room to her own… watching. Then suddenly the room was clear. The carpet as it turned out, was green. Who would have guessed? It was getting towards dusk as she gathered up her cleaning stuff and got ready to head back into the kitchen. She didn’t expect to see anything at the distant window unless some kind of light was on over there. There wasn’t any light on but she did see something. Something quite strange. The someone was still there in the gloom. Jules didn’t know that because she could actually see the someone – she couldn’t. She knew the person was there on account of the white board they were holding up to the window pane. Jules moved closer to the window, screwing up her eyes to see. The board seemed to have symbols on it – letters she imagined – but she could not make them out. It was all too far away. Then she remembered the binoculars. She had been going to throw them out along with his bikini-mags and his free video game preview DVD collection. She retrieved the field-glasses from the bag on the landing, snapped off the circular covers and tried to focus on the off-white board which was still hovering inside the gloom of the opposing window. That’s what the sign said. “What the hell does that mean?” she hissed to herself. Was somebody being held hostage over there? It happens. Not only in books either. At the moment, the board did a flip and suddenly there were different words to be read. She waited then, sensing there may be more and, yes, there was. There was one more board to be flipped and read. After that, the other boards came flipping around again, as if on a never ending loop of non-sense. When finally she got tired looking at them over-and-over she stumbled to the kitchen and found, deep in the unopened mail, a letter from her landlord giving her one month’s notice to leave her flat. London is a much bigger place and Sydney is very very far away. New York is cold in the winter and Bangkok smells of humidity and close proximity. It takes a long time to go around the world on your own and a lot longer to come back. It took seven years to come back. Jules found herself a new flat and slowly settled in. It was odd being back in the old town but the exotic sights and smells she still held inside her seemed to colour the place afresh. There were new possibilities all over, or so it seemed. On the 11th of May, after she had been one whole month in her new flat, she ventured into the rear bedroom to inspect the boxes she had thrown there upon her arrival. She glanced out of the window of this little box room and was suddenly overwhelmed with the most brutal wave of Deja-Vu she had ever felt. It was so strong that she had to sit on the edge of the bare mattress until it eased. Tentatively, she looked out the window again. She knew that house over there across the gardens or else one terribly like it. Then the geography of where she was clicked-in as if by magic. How could she have been so stupid? She used to live over there, seven long years before. There was nobody there of course. Nobody at all. Only the cupboard door, slightly ajar. The inside of the cupboard was musty and dry. A rattle of cheap coat hangers and a carpet of ancient newspapers seemed to be the full inventory of its contents. She was about to withdraw her head when the protruding edge on the upper shelf seized her peripheral vision. It was the boards. Three cardboard boards, each with faintly familiar words engraved into them. Up close, the letters seemed forced and jagged where the implement which had writ them had carved itself deep into the flesh of the boards. All through the next day, the date referred to on the boards, Jules tried to forget the pen-carved warning from the back room and the odd coincidence that had drawn her to live in this place without ever quite knowing where she really was. By evening time, thanks to four glasses of Pinot, she had quite forgotten all about them. She didn’t even remember when the front doorbell rang-out at five minutes to eleven. She stumbled to the door and automatically moved to open the latch. Something stopped her. Normally she would open her door without a second thought. It was, after all, a relatively safe town. But, suddenly, it seemed that certain black deep-writ words were imprinted on her brain. Her hand stopped in mid air over the latch. There was no further knock. All was quiet. Still Jules knew instinctively that somebody was out there, waiting. A light scratching commenced on the door. It started low and worked its way upwards and outwards on the outside face of the leaf. When it reached face-level, the scratching intensified until it seemed as if the outer veneer of the door leaf was being damaged and opened-up by the assault. “Stop,” she said weakly and the scratching immediately stopped. This was infinitely worse than the scratching had been. For some long moments, there was an acute sense of a poised listening from outside the door. Then, without warning, the scratching started again but now it was a wild unbridled tearing of a kind that no mortal nails could long withstand. It was like some demon on the inside of its coffin, tearing itself out. The terror that had built inside of her now unleashed itself in a scream of “STOP,” but this time the tearing did not cease. The door was being torn-through and eventually a hole would form on the inside and something would finger its way inside. “I command you to stop,” she suddenly said, and she did not know from where the words came. From outside, there came the stamp of heavy feet towards the top of the stairs and down and away and then there was nothing more. When dawn finally came, there was only that pale light which brings little comfort. The next night there was nothing, and the night after and every night after that. Nothing. Whatever had been seeking to get in had passed. It was Saturday before she went back into the rear bedroom. She looked across at the window two whole gardens away, noted that the net curtains had been removed, and thought she saw a thin spectral figure move deep within. She fancied she saw a furtive glance in her direction but it was really too far away to be certain. And, shortly after that, she started with the signs. This little story was inspired by a tweet I saw from a friend last Sunday. Twitter can be good for sparking things. Yes, very effective piece. Read it too quickly the first time. Needed to take my time over it. I was about to go to sleep. Ah, Ken's written a blog, I thought, I'll have a read of that first, he always makes me smile. I WAS ABOUT TO GO TO SLEEP! I was confused about the locations and time periods. I didn't understand she was in the other house until she found the notes. Not sure how much time had passed either. Then, at the end the leathery person and bare feet on the stairs... was the thing inside the house and does that mean someone else had already let it in? Thanks for reading, guys, you have no idea how very much I appreciate it. Laura: You know how I love to confuse you. :) Who drew the notes? I have a perfectly logical scenario for that but I'd prefer not to share here cos I feel there's a couple of ways the piece can be read. Thanks for coming by. Fantastic story, but I really need to know who wrote the boards! Awesome Ken, I could not stop reading until I was done, anxiously expecting something horrible at the end. But I'm glad nothing like that happened. but I know there's more to it than meets the eye. And several questions I would like answered.Like did some events happen only in her mind? or was she existing in two parallel worlds? or was she haunted by someone or something? by her memory perhaps? I would be very happy, If any of these come close to your plot..lol..
Can you enlighten me later, when comments are all in? I loved this story! I just couldn't stop reading. A stranger wrote the signs. Past Jules saw the stranger flashing the signs. Future Jules flashed the signs to another stranger. Alternate reality Jules was trying to get in the door! Ken I only read this today so I can't comment on any other version. However I really liked it. I found nothing confusing at all and even though I suspected the sign writer's identity the injection of 'the thing beyond the door' soon made it irrelevant. Great twist on a great twist. Where's Poirot when you need him. He'd get to the bottom of it in no time! Wow! This is an excellent story, and my kind of entertainment. This had just the right amount of creepiness to it. I love that the thing at the door wasn't seen. It gives it all a good air of mystery. Did anyone else want Jules to get eaten or was that just me?